Until a few weeks ago, Superstar Rajinikanth was working on two of his most eagerly awaited projects, Kabali and 2.0. Kabali’s shooting wrapped up in early April and the team got busy with the post-production. The film’s editing process has been completed recently. 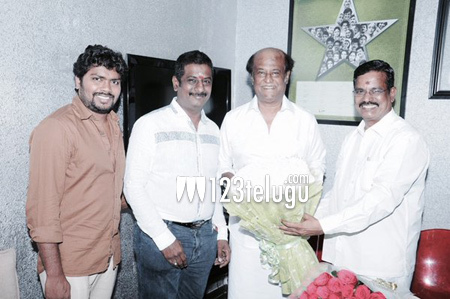 This morning, Rajini started dubbing for his part in Kabali after a formal puja. The film’s editor Praveen KL said on a couple of occasions that Rajini’s scenes involving his rise as a mafia don will surely give goosebumps to fans. PA Ranjith directed this stylish gangster flick and Kalaipuli S Thanu produced it. Kabali will simultaneously release in Telugu and Tamil in May.